Rendition of the Skylon in orbit (Credits: Reaction Engines Limited). 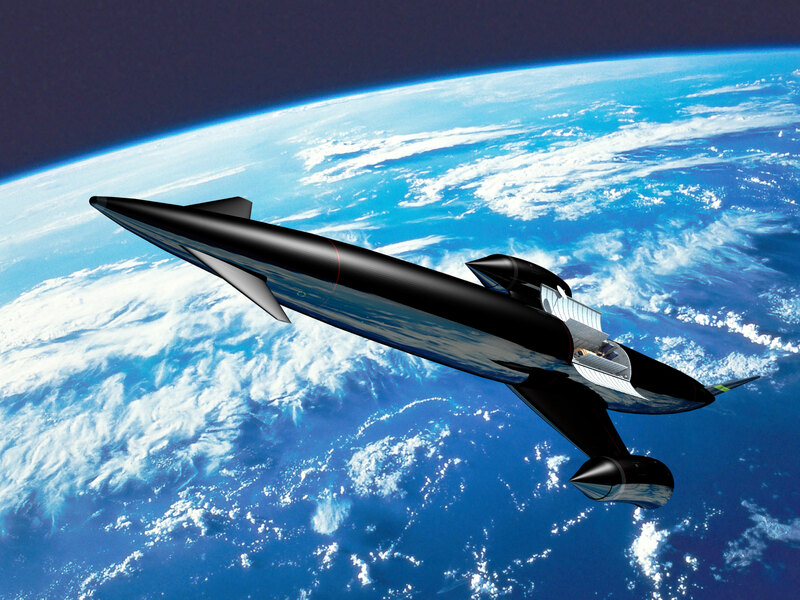 The Skylon is a spaceplane under development by British company Reaction Engines Limited. The plane is designed with a novel Sabre engine able to function either as an air breathing jet engine or as a rocket booster. A series of tests underway April through July 2012 will demonstrate whether this engine is ready to fly. The hybrid engine allows the Sabre to carry less oxidizer than regular rocket engines by using ambient oxygen in the atmosphere for as long as possible. Such air breathers, as they are called, are not a new idea, but the execution is complicated by the need to handle intake gases at widely varying temperatures and humidity. Reaction Engines has tackled this problem with a heat exchanger able to reduce intake gas temperature to -140C in 0.01 seconds. The heat exchanger, known as a pre-cooler, uses helium at -170C as the exchange gas. The helium is then recovered by passing through a nitrogen boiler. Diagram of the Sabre engine (Credits: Reaction Engine Limited/BCC). Successful completion of the current test series, which aims to assess the critical pre-cooler function, along with last year’s completion of an ESA technical review, could enable Reaction Engines to raise the £250m it needs to complete the next phase for Skylon. “It gives people confidence that what we’re doing is meaningful and real – that it’s not science fiction,” says Bond.